As the wood and metal hinges age, they can cause the doors to bind and stick. Doors can sag in their frames, multiple coats of paint applied over the years can create buildup, and the hinges and doorknob can also rust and need to be replaced. If the door has a hollow core and the plywood has weakened over time or if a significant amount of force is applied, holes can be made into the door. 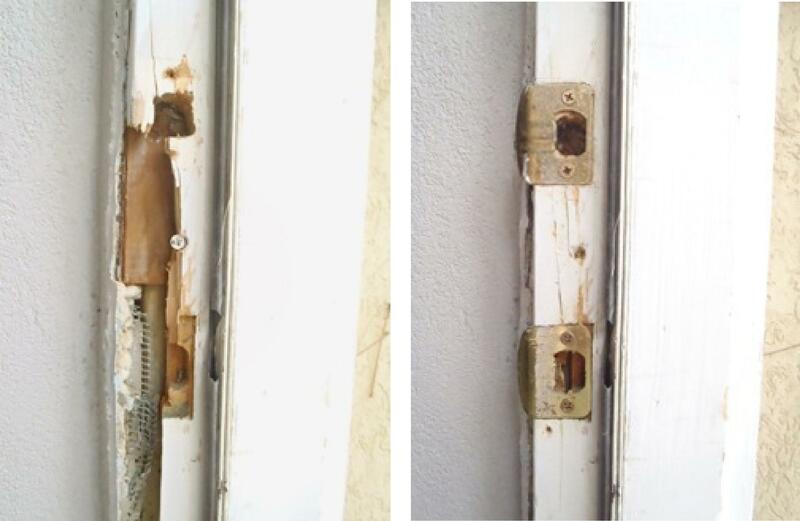 While a hollow core door is difficult to repair, it can still be done with the following steps. 1. Assess the damage done to the plywood. The size of the hole in the door as well as how hard the door was hit will tell you how difficult the repairs will be. If the force is hard enough, there will be pieces of the plywood stuck inside the hollow core door. 2. Clean out the area of impact. Remove the debris or pieces of the door that happen to be sticking out after the impact, as this could result in splinters when you try to repair the door later on. Be sure to sand the sharp edges and wipe the dust around the area, as well as clean it, preferably with a cleaner that doesn’t leave any residue. 3. Fill the hole in the door. For the hole in the door, stuff paper towels into the hole, or even simply crumpled paper or cardboard, all of which serve well as filler. Once the hole is stuffed with paper towels, spray the hole with foam insulation and wait for the foam to dry before removing any excess. 4. Make the repairs in the door with filler. Using spackle, proceed to repair the damaged area. Preferably, you should use spackle to fill the area, as car bondo dries more quickly and is poorer in quality than the former. Be sure to use a spackle knife to do this. After filling in the area, clean up any other residue around it and wait for the spackle to dry, which can take a while. If your door happens to be textured, etch the area gently with the door’s texture only when the spackle is almost completely dry. 5. Sand the area using sandpaper with a fine grit. Once the spackle has completely dried off, proceed to sand the area. After sanding the spackle, be sure to wipe it down with a clean cloth to remove any formed dust and debris. If you find that the initial coat of spackle isn’t to your liking, or that the texture doesn’t match the rest of the door, apply another coat and let it dry before painting it over. You can even repaint the whole door if the area doesn’t match.